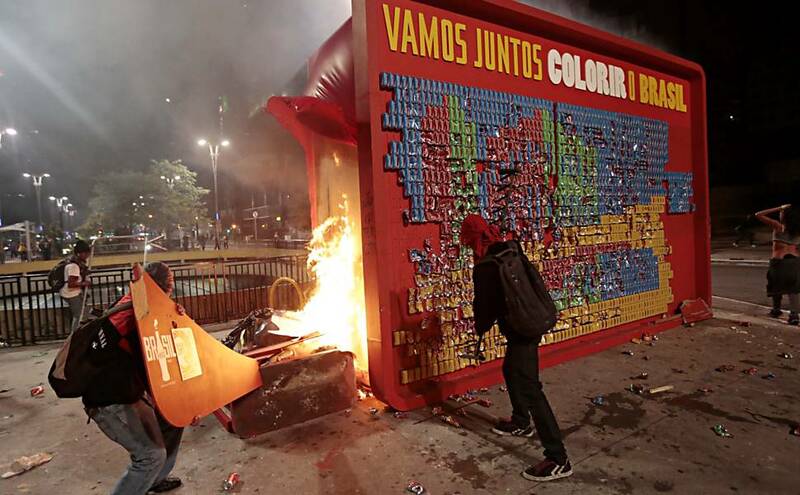 The protests that have flared in Brazil in response to a 20-centavo rise in urban bus fares have produced some spectacular – and familiar – scenes. Brazil’s cities are no strangers to disorder, of both the licensed kind (Rio’s annual carnival) or the wildly unlicensed. For the latter, you only have to think back to the extraordinary events of May 2006 when a criminal gang, the Primeiro Comando da Capital (PCC) briefly took over the entire city of São Paulo. The novelist Teixeira Coelho described an extraordinary scene to me a few months later. After the initial violence, there was a period of utter, complete, silence during which this metropolis of 11 million souls appeared to have been abandoned. It was a state Coelho had experienced once before: on a canoe in the middle of the Amazon. May ’06 was admittedly exceptional. But the streets of São Paulo, until recently at least, could give the visitor the impression of civil war, even when it was just football at stake. That impression of ‘undeclared civil war’ was much cultivated by local journalists, much as their counterparts did in 1920s Chicago. Brazil’s violence was (for more people than should have been the case) good for business. Good for traffickers in drugs and guns certainly, but also private security firms, developers of gated communities, and (sadly) novelists, and film-makers. The movie version of Cidade de Deus, about a Jacarepaguá slum, was a huge international hit in 2002. The fact is, however, that Brazil’s cities had been getting safer at exactly the moment artists were celebrating their violence. By the early 2000s, São Paulo was rather safer than most American cities. By 2006, its had Glasgow licked, at least by one measure. Whatever the statistics, there is no question Brazil’s cities felt safer. When I first visited São Paulo in 2001, my Carioca friends advised me to keep a boca fechada (mouth shut) at all times, lest I reveal myself as a foreigner, and therefore, a target. I duly obliged, locking my belongings away, rarely venturing out, and having a somewhat miserable time. Ten years, and as many visits later, I strolled the Avenida Paulista with impunity, bearing a laptop, camera, I-phone, and a pocket full of cash. Just like (it seemed) everyone else. Brazil has got a lot richer, especially during the pragmatic and assured presidency of Luis Inácio Lula da Silva. Its middle class got visibly bigger, and more confident. It even started to make some progress on the intractable problem of slum housing. The favela-bairro projects showed how it was possible, with imagination and money, to create viable low-rise neighbourhoods that could easily attract middle class residents given a couple do decades of stability. I saw several of these, including the hugely impressive Paraisópolis, abutting the São Paulo suburb of Morumbi. I could see this, no exaggeration, as an incipient urban village. Lula invested heavily in education, too, and could make so decent claims about widening opportunity. There were big infrastructure projects, especially in the cities, and a rush of investment in the state-owned Petróbras to capitalise on the discovery of offshore oil. It was going fantastically well. Brazil looked as if it was – finally – starting to realise the ordem e progresso emblazoned on the national flag. What happened was (first) a period of economic slowdown that looks distinctly European. It has barely grown as an economy in two years. And there was much talk, inside and outside Brazil, of o custo brasileiro – ‘the Brazilian cost’ – the sheer expense of doing business in the country. Brazil has not been a cheap country for decades. Now, however, it is a distinctly expensive one – as well as bureaucratic, slow and awkward. Therein lies the problem. It has become rich. It is, measured by GDP per capita, certainly a middle-income one, comparable with the newer states of the EU. Its uneven wealth distribution conceals the existence of a vast urban middle class who live, and spend, like the richest 10% in London or New York. There is serious money here, and lots of it. This wealth – and more to the point, the sense that wealth is now within reach – has arguably created new tensions. Public services have undoubtedly improved, but now Brazilians expect them to be better. And for the most part, they are bloody awful. You smell Rio de Janeiro long before you see it; the untreated sewage around the aeroporto Tom Jobim produces is of the world’s great stenches. In São Paulo, hopeless drains mean summer rains invariably bring the city to a standstill in minutes. Outside the cities, highways are often dirt tracks. The trans-Amazon highway, built by the military in the mid-sixties, has become impassable. And so on. The architects of Brazil’s recent boom, Lula and before him, another Marxist-turned-neoliberal Fernando Henrique Cardoso (‘FHC’) would argue, with justification, that economic progress is never smooth. They would point to the success of Brazil’s brewers, or its excellent low-cost airlines, or its plane-maker Embrarer. Building a stable, democratic economy takes time. The problem for Brazil’s residents, wherever they are in the country’s social constellation, is whether they have that time. The super-rich have the benefits already. The rest – in short anyone who depends on public services – will have to wait. They had got used to expecting very little from government except corruption and violence. Now government has raised its game, but in so doing it’s raised expectations. That’s why Brazil’s cities have blown up.